A 14-year-old Palestinian boy was shot and killed during mass protests along the Gaza border and 10 others wounded by live fire, according to the Hamas-run health ministry in the Strip, writes timesofisrael.com. Nearly 7,000 Palestinians gathered along the border for the weekly demonstrations and riots, throwing rocks, fire bombs and explosives at soldiers, who responded with tear gas and occasional live fire.The health ministry said that the boy, identified as Hassan Shalabi, was shot in the chest in a protest near Khan Younis in southern Gaza. The Israeli army declined to comment on the death, but said 6,700 “rioters and demonstrators” had been protesting along the frontier. “They are hurling rocks at troops and towards the security fence, as well as a number of explosive devices that did not cross the fence,” a spokesman said. Israeli troops “responded with riot dispersal means and fired according to standard operating procedures,” he added. For the past several months, Egypt, UN special coordinator to the Middle East peace process Nikolay Mladenov and Qatar have worked to try to restore calm in Gaza and prevent flare-ups between Israel and terror groups in the Strip. In recent weeks, tensions between Israel and terror groups in Gaza rose after a Palestinian sniper opened fire on a group of Israeli soldiers. The bullet hit the helmet of an officer, lightly injuring him. On Wednesday, Palestinians fired a rocket into Israel. The projectile reportedly fell in the southern area of the Sha’ar Hanegev Regional Council. There were no reports of damage or injuries in the attack. In response, an Israeli tank opened fire at a Hamas position in southern Gaza. Also this week, Israel announced that it had begun the final phase of construction of a 20-foot high galvanized steel fence that will completely surround the Strip. The barrier will extend 65 kilometers (40 miles) miles around the enclave and sit atop the subterranean concrete wall Israel is constructing around Gaza to block terrorist groups’ attack tunnels. Friday’s protests were held at various locations along the border under the banner of Hamas’s ongoing “March of Return” demonstrations. Since March, Palestinians have been holding weekly “March of Return” protests on the border, which Israel has accused Hamas rulers of using to carry out attacks on troops and attempt to breach the security fence. Israel has demanded an end to the violent demonstrations along the border in any ceasefire agreement. 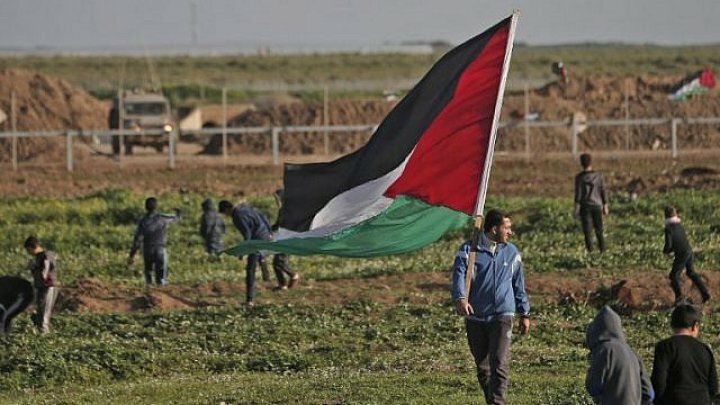 The protest organizers have said the demonstrations aim to achieve the “return” of Palestinian refugees and their descendants to lands that are now part of Israel, and pressure the Jewish state to lift its restrictions on the movement of people and goods into and out of the coastal enclave. Hamas, which violently seized control of Gaza in 2007 from the Fatah-dominated Palestinian Authority, is a terror group that seeks to destroy Israel.